Netflix Sunderland Documentary Is Exceptional Viewing. Please Celtic, Never, Ever Agree To This. Well, last night after I chucked it for the evening I was going through Netflix looking for something a bit different to watch. What I found was something a bit special instead; their incredible fly-on-the-wall documentary Sunderland ‘Til I Die. Every footballer supporter should see this. I am not joking. Eight episodes, each around 45 minutes long, just flew by. It is astonishing that a documentary team got this much access to a club which was going through a dark, dark spell. It is amazing that they captured so much raw emotion, so much truth. I was transfixed by it, honestly. It is a superb – and harrowing – chronicle of a team in freefall, melting down before your eyes, a team which, it swiftly becomes apparent, had ceased to be one long before the cameras rolled. Two years ago, I went on holiday having bought the entire catalogue of Secret Footballer books for chilling out around the pool. In one of them, the writer talks about the Adam Johnson situation. He said something that stayed with me and which I kept thinking about as the remarkable story of the 2017-18 season at the Stadium of Light was unfolding like a slow motion disaster. He said that when the story broke about the at first un-named Premiership footballer he’d have put money on him being a Sunderland player. He said that the only surprise was the identity of the man himself. He said there were a half dozen others at the club whose names would have come to mind before Adam Johnson. I am sure he didn’t mean that a lot of their players are engaged in that kind of activity; what he meant is that the club is notorious in the sport for the indiscipline inside it, for the attitudes of a squad which has nothing in common with the fans who you see go through a rollercoaster of emotion in support of their team. What he described as a “drinking culture” that was unprecedented in the league seemed to match much of what was happening on the screen, but more than that it offers an explanation for what you don’t see but can sense in a number of scenes … a club riven by some deep seated malaise, and whose players appear to be pulling in opposite directions from the very first day of the league campaign. Even before that there is a stunning moment which sets the tone for all that comes later. The first episode opens with us going there for their last pre-season game. There is optimism amongst the fans. What they see of course is Rodgers’ swaggering Invincibles destroying them 5-0. In the aftermath of the match, the club’s midfielder Darron Gibson heads out on the piss, encounters some of his club’s fans in a boozer and seriously the worse for wear offers his “opinions” on his team-mates. Let’s just say he isn’t exuding confidence for what lies ahead. It is an astonishingly negative opening to the season for everyone at the club, and in particular for the new manager Simon Grayson. It is a headache he certainly doesn’t need. Gibson is involved in another incident towards the end of the season, another unsavoury moment at the centre of which is booze. You could not make this stuff up, it is too close to the bone. The club’s director of football is a man who will be familiar to all Scottish football fans; it’s Martin Bain, formerly of Rangers, and he cuts a forlorn figure almost all of the time. He and those who work under him are simply overmatched by the scale of the disaster they are in charge of managing; you see Bain work tirelessly to get signings done, his frustration as opportunities slip through his fingers and you watch him agonise over Grayson’s future as the slide becomes a drop. At no point does he seem like a man in control; he exudes confidence at certain points, but it’s not even a very convincing façade because the next reversal is never far away. The next disaster is already on the other side of the wheel, coming round. I don’t know whether Bain is just dreadful at his job – his time at Ibrox was hilariously bad and suggests that he is – or whether the club was just an untamed shambles that nobody could have fixed, but it makes me not want to complain overmuch about Peter Lawwell for a while. There are moments which are genuinely painful to watch, like a young footballer who has given the club everything over the campaign breaking down talking to the camera, and Chris Coleman, who exudes calm all the way through his own abysmal time as boss, snapping with a fan in what’s nearly a very ugly scene after the club’s fate is sealed. But it’s the little moments of dissent and disharmony that will haunt me and they are the reason I would be appalled if Celtic ever decided to do something like this. You might think you want to know what goes on behind the scenes at your own club, but believe me there are moments that are better off forever remaining private and which should never see the light of day. Take the scenes involving players talking to the camera, on the record, about their team-mates and their manager; they are deeply disturbing and would be devastating to everyone concerned if all the parties were still at the club when the show finally aired. There is a scene involving a player who’s on the way out the door and who can hardly wait to leave; his lack of professionalism and total unconcern as he abandons ship is openly expressed. There’s also a scene involving players sniggering over a potential new arrival; I’m not joking. Senior pros actually slagging a senior pro at another club who at that point seems to be on his way to theirs. The way it lays bare relationships between people inside the walls is deeply unsettling. An early scene involving Bain and the club’s head of youth development as they plan the club’s transfer strategy – which is only then imparted to the manager – is the sort that would have had fans burning season tickets on the spot had they known what was going on behind the scenes. Imagine a similar scene involving Lawwell and Lee Congerton; it chills the blood. Especially when you consider that Congerton was Sunderland’s director of football. Celtic is a club that is sometimes accused of playing its cards close to its chest. Watching this I am partly glad that they do. Believe me, there are things we don’t want to know, such as which players are suffering through confidence crises so bad they are talking to the club shrink about how demotivated, even terrified, they feel. Listening to seasoned pros talking about their manager with casual disdain is a shock to the system. Imagine watching a behind-the-scenes look at the Mowbray season; who, really, would want that much information? Who would want senior footballers to go on the camera and mouth off about him in a way that made you recoil when you saw them, later, still in the team? Imagine a documentary on the events of our summer just past; I mean, really. One of the only saving graces from that spell was that most of it was kept out of the public gaze. There’s one footballer in the documentary who is mentioned a few times but never appears on the screen; he was the highest paid at the club but was so ineffective he wasn’t even playing most weeks. They were desperate to get him off the books, but he remained to hive off big money. We know there have been players who’ve stayed at our club on high salaries who we’d have loved to move on and never did; if you think you’re peeved now imagine seeing scenes where the club desperately tries to free up a few quid for the transfer window by offering him moves elsewhere only for him to steadfastly turn them all down and consequences to the club be damned. 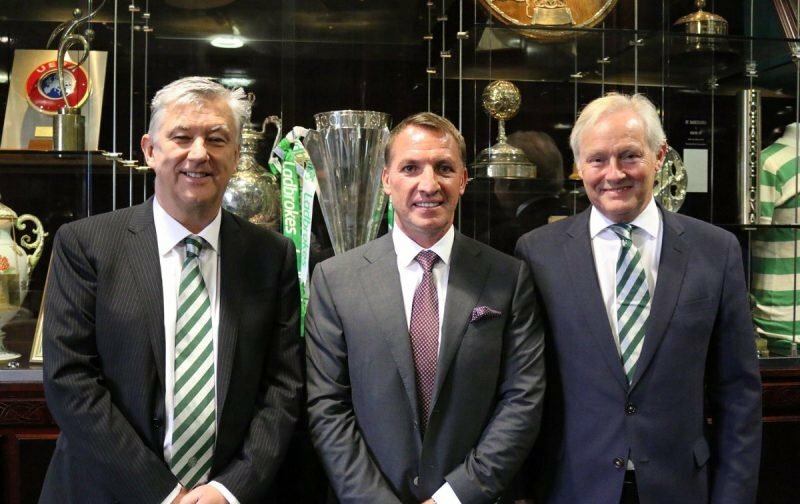 Since taking over as the manager at Celtic, Brendan has largely stamped out the dressing room leakers. That’s why Kris Boyd’s idiotic comments about splits was so easy to dismiss. Nobody talks out of class at Celtic; the persistent rumour that Mulumba was dropped because he foolishly spoke to the media when he shouldn’t remains just speculation but it makes a lot of sense. Whoever let that story into the public domain was careful not to get caught lest they suffer the same consequences; it’s not even out of the question that the leak was strategic, to serve as a warning to others to watch their mouths when speaking with the press. I know a lot of Celtic fans thirst for information about the club, all day, every day. So do I. Most of the time. But during our summer of fun I didn’t want answers as much as for someone to reassure me that everything was going to be alright. We still don’t know what the final, full, effects of those events were; most days I try to put that out of my mind. But I know this; say a documentary came out halfway through next season which laid bare everything that had gone on behind the scenes. It would be like detonating a bomb at the heart of the club, and then there might be no recovering from it for years. It is impossible to watch Sunderland ‘Til I Die and not imagine your own club captured so nakedly, all artifice stripped away, laid bare from boot-room to boardroom. It took enormous courage for those running the club to agree to it; it was either courage or Bain really is an insatiable self-publicist who couldn’t wait to be on camera. Did the documentary makers sense, when they were pitching it, that things were so bad behind the scenes that they were going to be filming an extraordinary denouement to a crazy era at the club? Put simply, did they suspect that what they were going to capture would be train-wreck TV? Was that what motivated them, or did they genuinely think they were going to film the phoenix-like rise of a newly relegated club as it shook itself off and rebuilt? Whatever they thought, I think they realised quickly the nature of what they were capturing on camera; what is most extraordinary is that those in charge there did not restrict their access, and did not terminate the project as swiftly as they terminated the manager. I don’t know whether the Sunderland fans are grateful for that or horror-struck. I just know I wouldn’t like it to be me. I wouldn’t like it to be us. Sunderland fans can take heart from the ending; it does suggest that better times are ahead. There is talk of “cleansing” the whole place, and that word appears fitting. Celtic is in a very stable place right now, in spite of the summer of fun; how long we’d stay that way if we knew more than we do … that’s the question that I really don’t think I want the answer to. What a wonderful documentary series that was. It was thrilling, and every fan of every club should watch it. Please, Celtic, please … never, ever agree to do anything remotely like it.